I had this great idea for my next Quilting Bee. I was going to have everyone make me a tree block loosely inspired by this quilt but ONLY trees to make it an unofficial Christmas quilt. But...... I got so excited that I started getting the fabrics together (even though my month is not until December hehe) and wanted to make one of the blocks as an example. I really want each tree to be different sizes and to look different, atleast that is what I have in mind but until I start sewing who knows what will happen. For example this was my first time trying the "fan" and I am really happy with it but the tree ended up being really big. Also I think now that I will make the rest of the blocks with brown tree trunks so I will either unpick this one and add in a brown one or use it for the back of the quilt. Oh and each block will be 12". I think I am too excited to wait for my month and I am going to try it all by myself. I have plenty of time.....right? So it is official I started a Christmas Quilt today! We will see how it goes since I am almost 8 months preggers and don't know how long I can keep up the sewing because this other WIP that I have started really needs to come first. 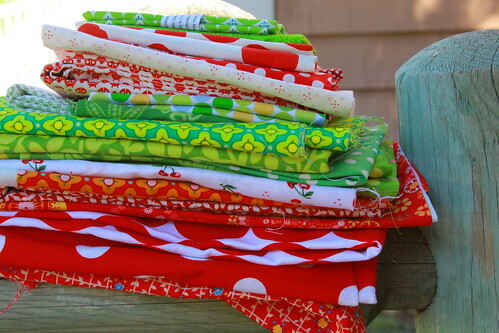 Here are all the fabrics from my stash that I have collected. I will try to just use these so that I don't have to buy anything except the back of the quilt which I would love to find an awesome red dot for. I also read on someones blog (does anyone know who it was??) that they started keeping their WIP's in plastic containers. 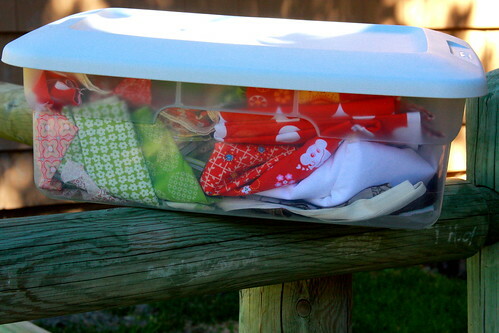 I thought that was a great idea to keep it all together and since I already keep all of my fabrics in containers it would all go nicely. I think I will try to make a block every couple of days and see how it all goes. Wish me luck! I love how your blocks have turned out! 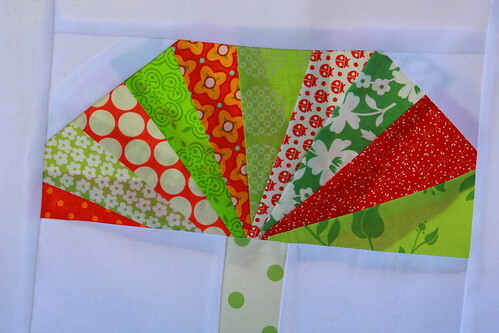 maybe if you cant make enough for you entire quilt, your bee can help make the rest fo the blocks for a nice big quilt? Love the idea of keeping each project in a container like that too, then you have plenty of room for it all! I love that design! Yes, you could make so many different trees with little fruits using buttons....oh too much here...very cute. 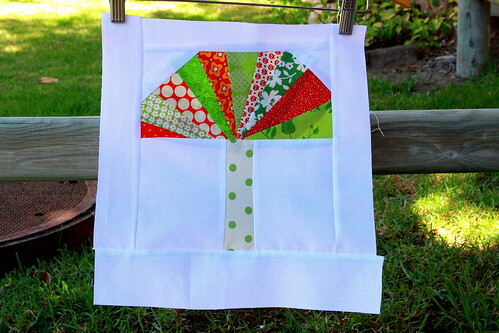 I also keep fabrics in clear containers, but always forget where I put what..
A tree quilt is a wonderful idea! 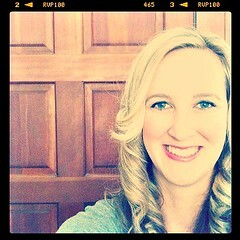 And eight months along, I would probably get it going now too!